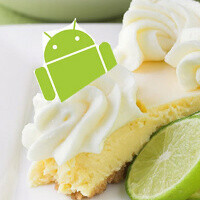 Could Android 4.2.2 be the last Jelly Bean version before Key Lime Pie? The Android 4.2.2 Jelly Bean update has just started rolling out to Nexus devices, and it might be the last Jelly Bean update as Google jumps directly to Android Key Lime Pie after 4.2.2. Why? Italian HD Blog dug up the official Android source page at source.android.com and noticed Google’s interesting wording where the last iteration on each Android version is referred to as ‘latest.’ So basically could this mean that whenever a version gets 'latest' in its description, that means 'last' in Google's terms? Now, this is an interesting observation that would mean 4.2.2 Jelly Bean will be followed by Key Lime Pie. We don’t know much about Google’s wording here and it also seems possible that the company is simply adding latest to whatever version is out there, so that if 4.2.3 ever gets released it will be the one marked with ‘Latest’ and Google will strip the ‘Latest’ word from the 4.2.2 description. So for the time being, this is nothing more than an interesting assumption derived from Google’s interesting wording. It does ally well with rumors of Key Lime Pie getting introduced at Google I/O in May, though, so why not? What do you think? Right below is the Android version history straight from Google's official source code site for Android. yes .. that is last update. Stop Trolling.. Where do you find a lag? I have GS3 and Nexus 4, Both running their respective latest Android versions, ie 4.1.2 and 4.2.1 and I swear there is minimal/no lag in both phones. Either you are an Iphone or have Android 1.6 DoNut running on your phone. They are lying.. ! jellybean Never lag .. Some apps makes problems..but if sumthng lag happens becoz of apps , that particular app will restart within next 5 seconds .. not like OLD phones taking minutes may be we have to remove battery to restart.... btw Phone never lags .. this phone never went turned off by itself .. NEVER !! i seriously wana ask .. what you mean by lag ? Exynos Quad Core really helps ... i believe it is MOST POWERFULL CHIP for the phone .. ! You are wrong in last point, Exynos Quad Core is NOT the Most Powerfull chip out there. Havent you heard of anything called snapdragon, qualcomm etc?? I have a GNote 2, and I also have lag issues (minimal ones) but I guess it mainly comes from solely the Application's programming. bogdancirstea, maybe if you didn't buy one of those low-end JB Android--ya know, the ones that come in a plastic box and have a "Pay As You Go" sticker on the front--you wouldn't have "lag." Get a real Android, bro. I dont know about the next nexus part, but 5.0 will be on the Motorola X when it is announced in May. Why is it europe gets the update before the u.s.?